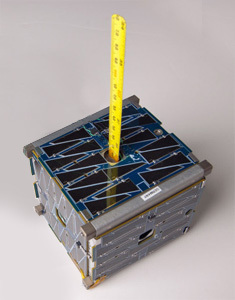 PhoneSat 2.0 is a technology demonstration mission consisting of a 1U CubeSat intended to prove that a smartphone can be used to perform many of the functions required of a spacecraft bus. PhoneSat 2.0 features a newer Nexus-S smartphone made by Samsung Electronics running Google's Android operating system to provide a faster core processor, avionics and gyroscopes. PhoneSat 2.0 also supplements the capabilities of PhoneSat 1.0 by adding a two-way S-band radio to allow engineers to command the satellite from Earth, solar panels to enable longer-duration missions, and a GPS receiver. In addition, PhoneSat 2.0 adds magnetorquer coils – electro-magnets that interact with Earth's magnetic field – and reaction wheels to actively control the satellite's orientation in space. The satellite called Alexander was launched as a secondary payload on the maiden flight of the Antares-110 launch vehicle in 2013. In improved version called Phonesat 2.4 was launched in 2013 on a Minotaur-1 booster. PhoneSat 2.5 was launched piggy-back on a Falcon-9 v1.1 in February 2014.